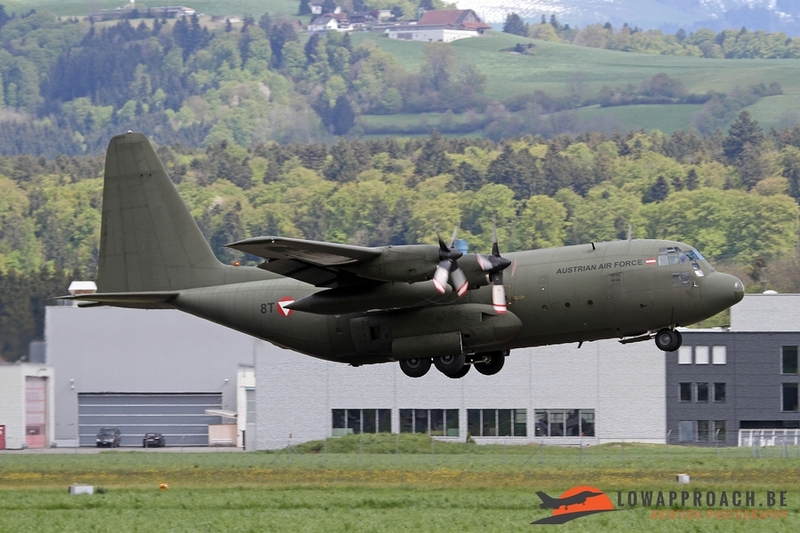 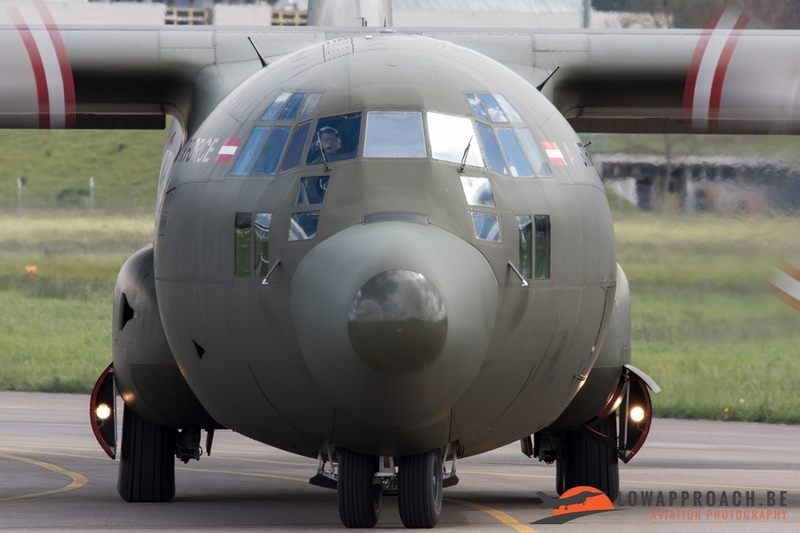 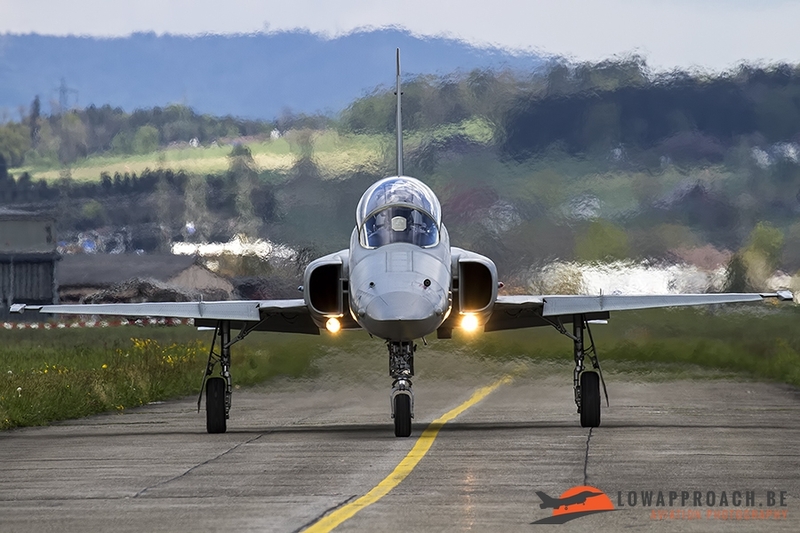 During our spotting trip from April 2016 the Low Approach team also spend two days at Militärflugplatz Emmen. 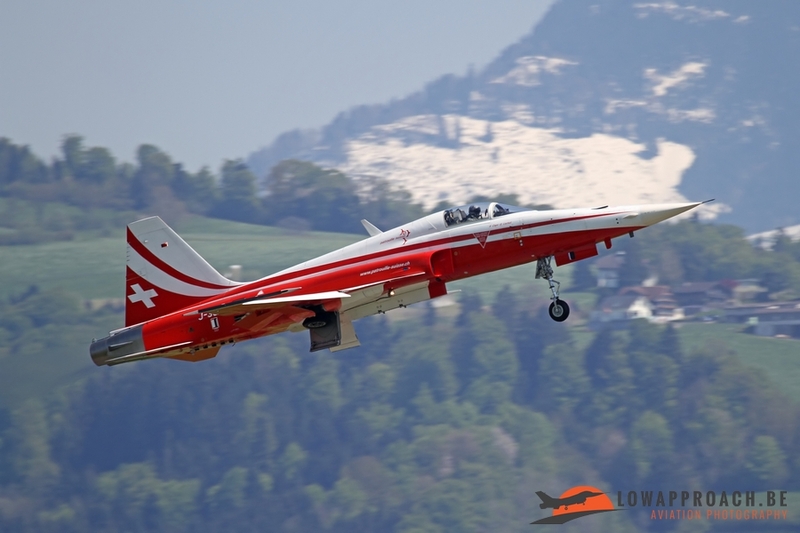 Emmen is located near Lüzern in Central Switzerland and can easily be combined with visits to Alpnach, Stans-Buochs and Meiringen. 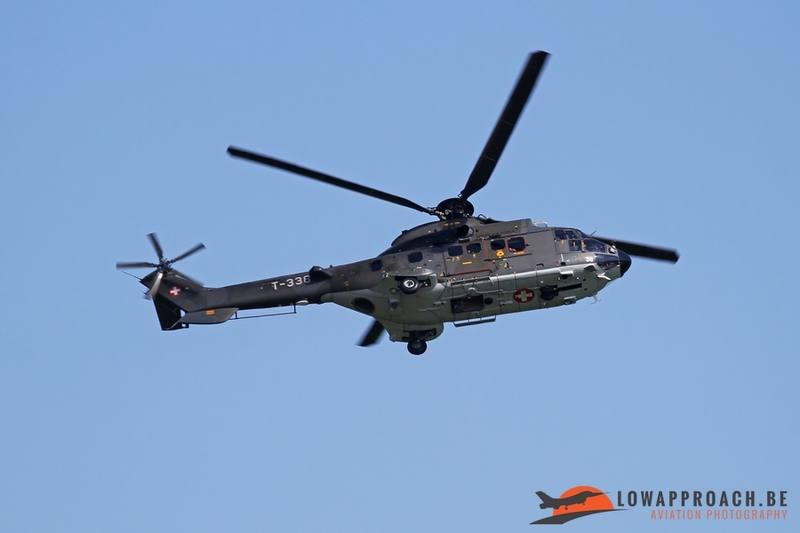 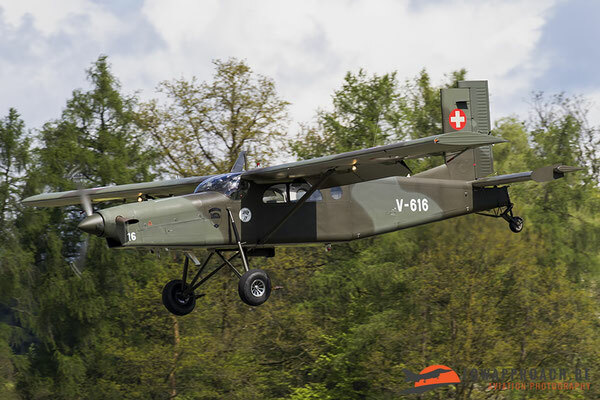 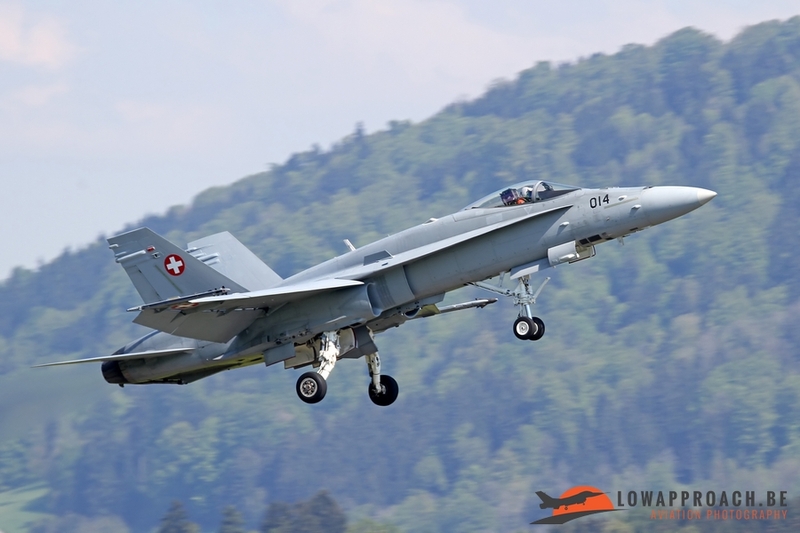 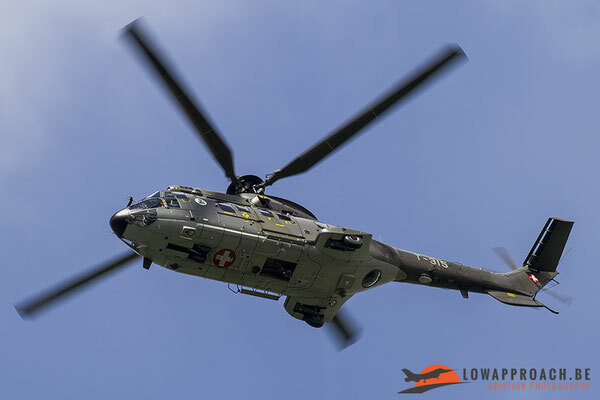 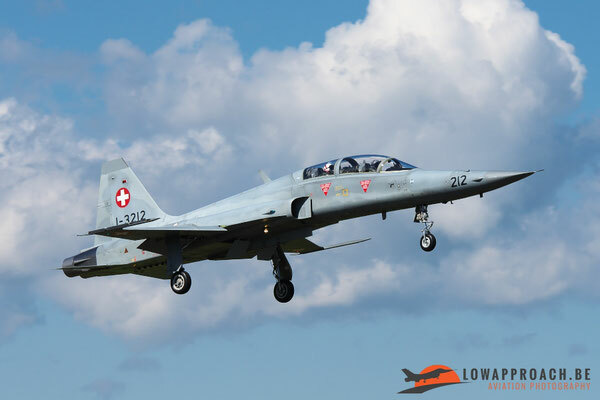 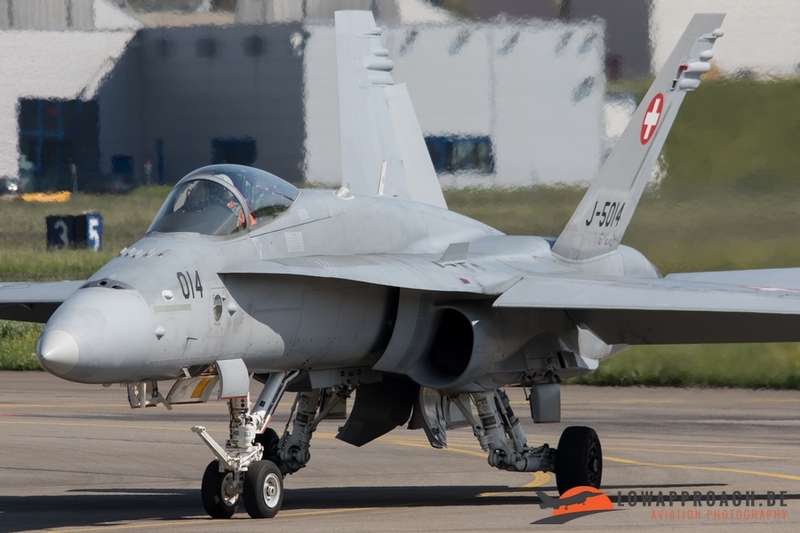 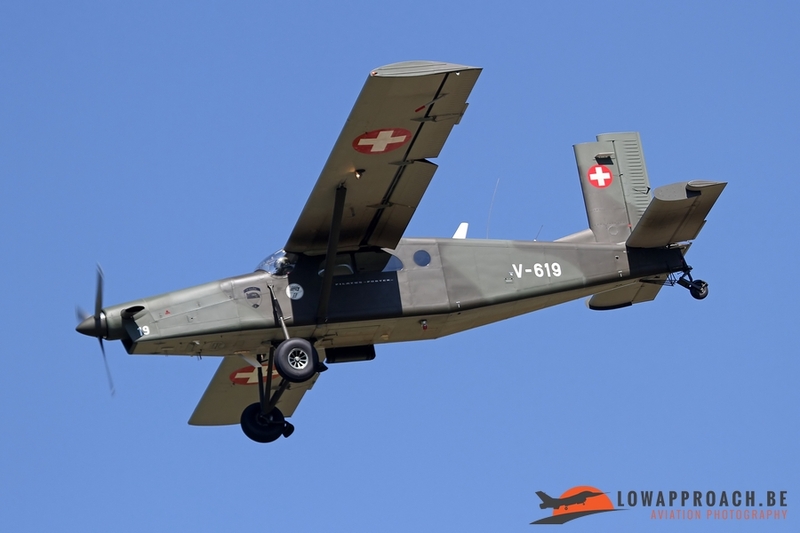 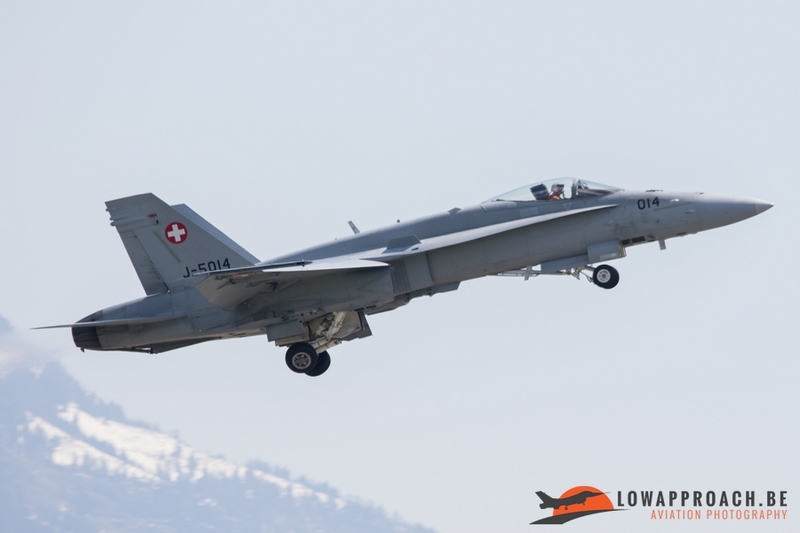 Of all the locations we visited we can easily say that Emmen has the most diverse aircraft on offer, and this combined with some interesting visitors makes it an ideal spot for spotters who want to catch several Swiss military aircraft types in a short period. 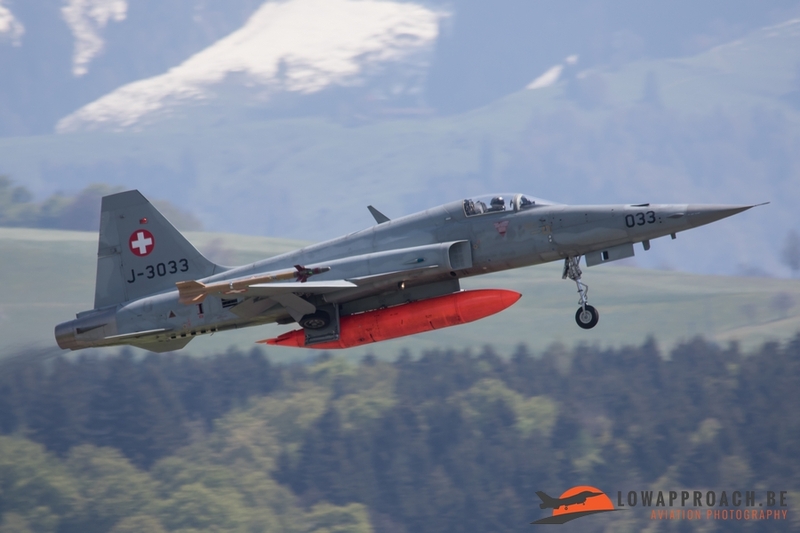 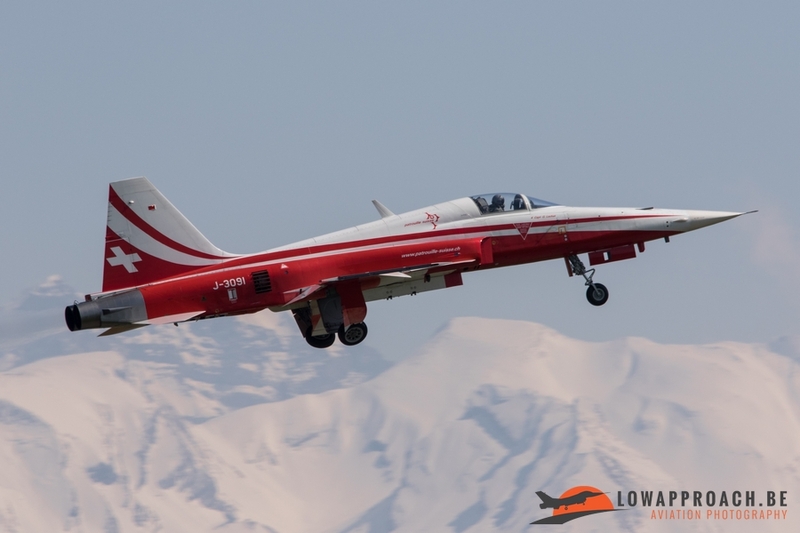 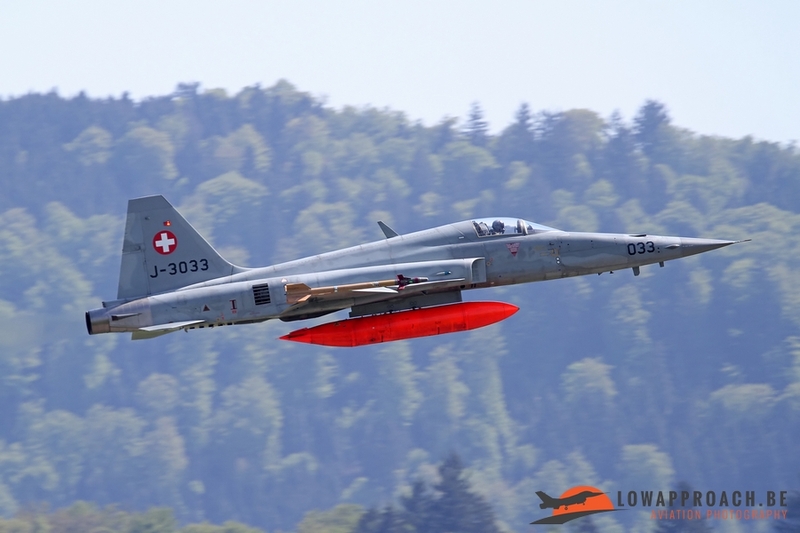 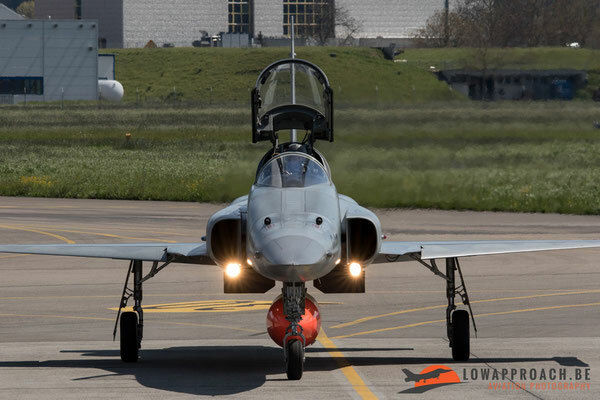 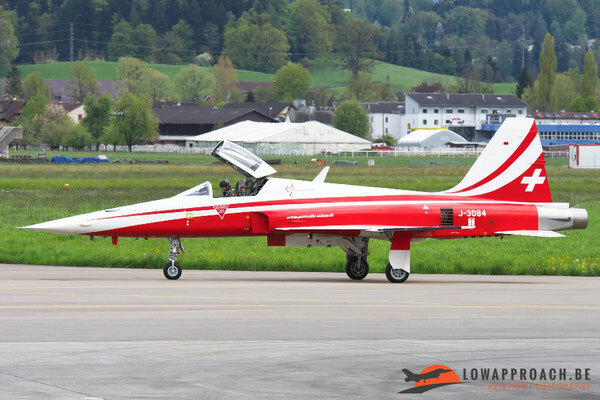 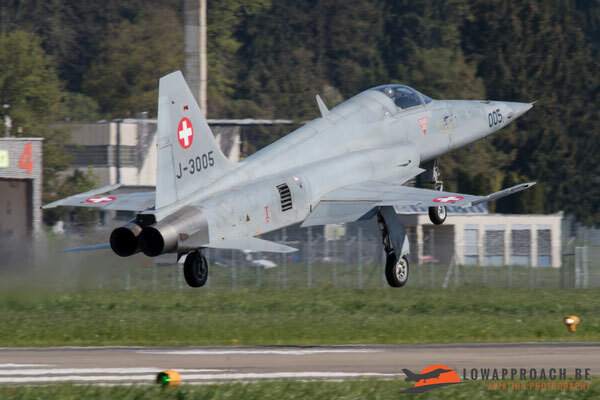 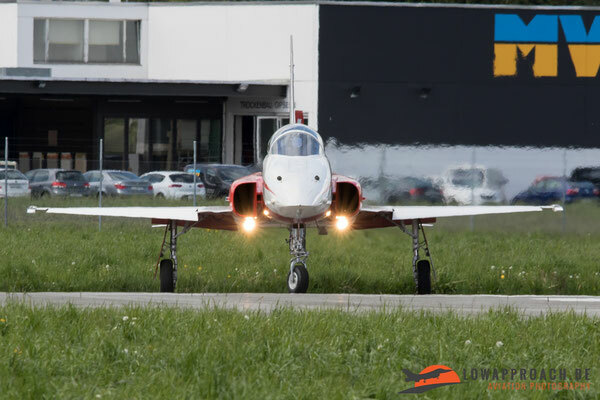 Best known unit based at Emmen is off course the Patrouille de Suisse demonstration team, equipped with the Northrop F5E Tiger II. The red and white F5s are a common sight during summer when the team performs at several airshows across Europe. 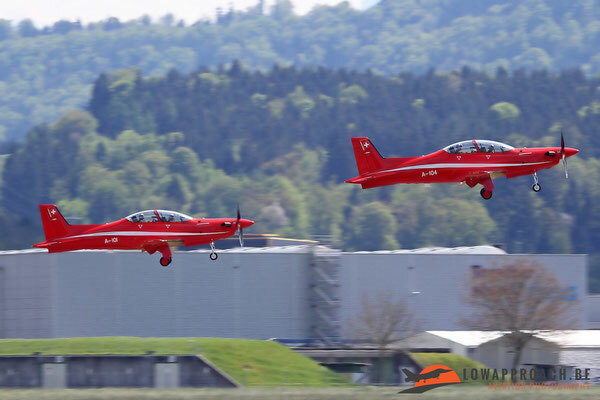 Outside the airshow season the teams' aircraft are used for operational flying as well, so during our visits we managed to see several examples. 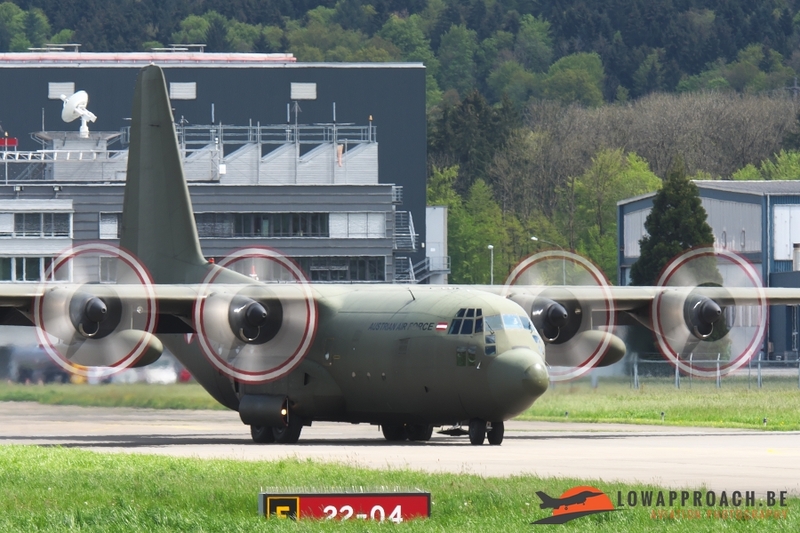 Spotting at Emmen is fairly easy, first of all they have a nice spotters area from which most of our pictures were made, but it's also possible to find spots near both approach areas. Unfortunately during our visit the wind was quite unpredictable, and the approach was swapped several times, so we choose for the more central spotters area in order to miss as little as possible of the action. 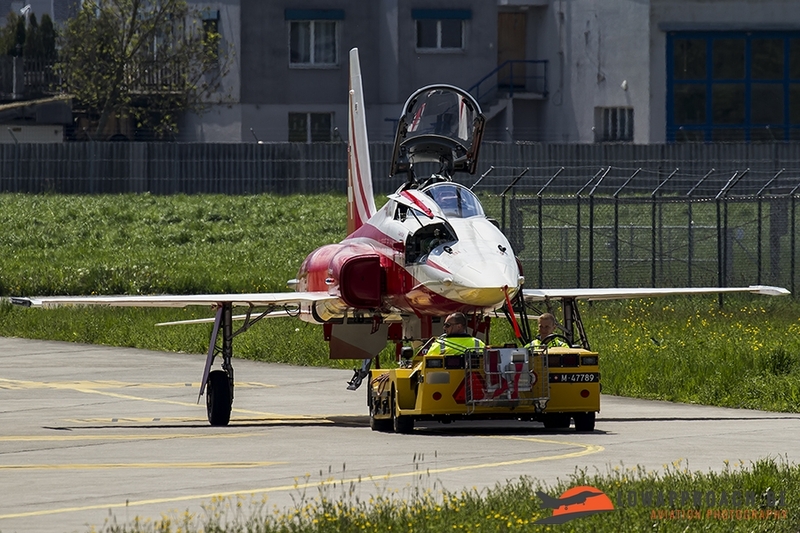 This area is also close to one of the 'hangarettes' which are used to prepare the aircraft for flight. 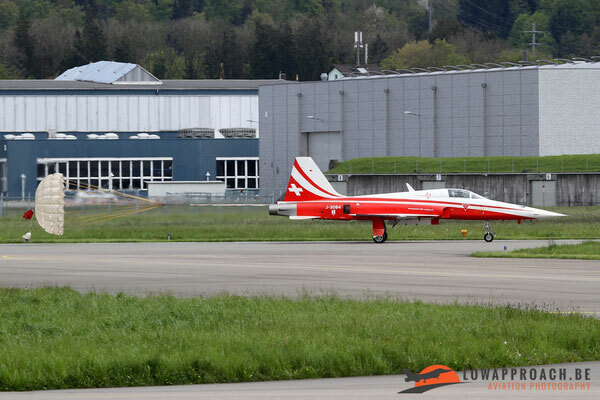 So you can see the aircraft taxi out and back after the flight. 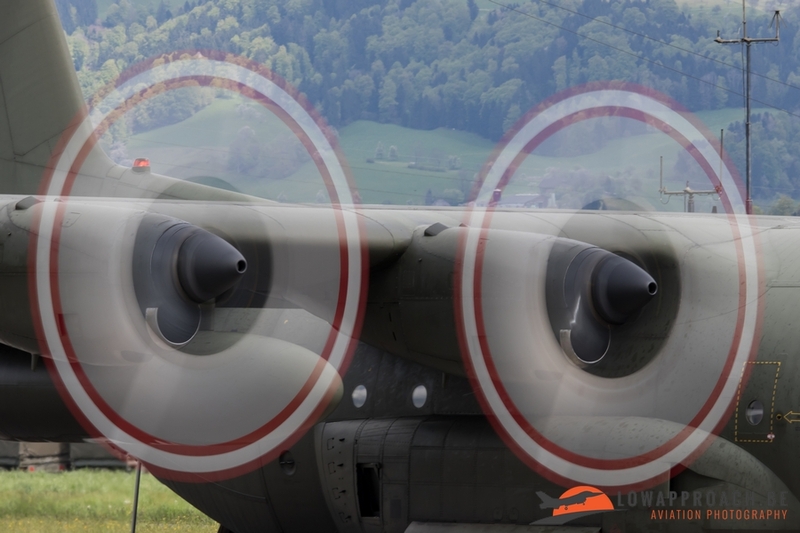 These hangarettes are used by virtually all aircraft types at Emmen. 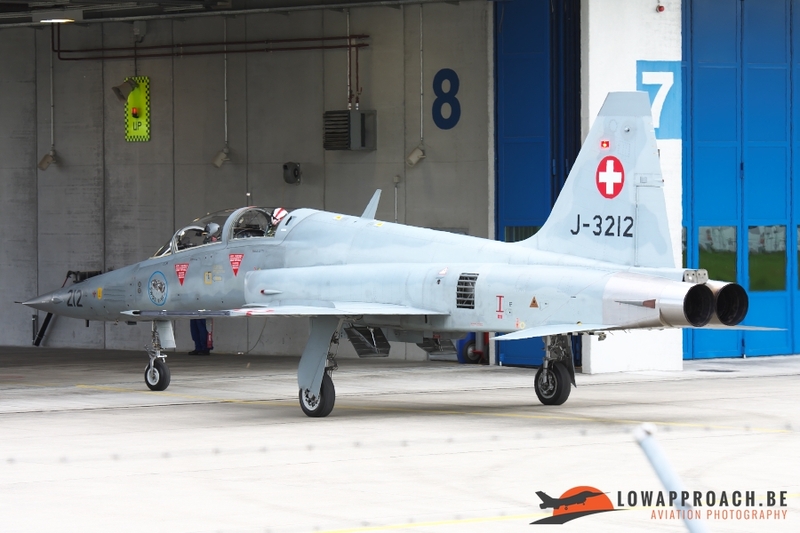 Not only the red and white painted F5s were present during our visit, also a handful of F5s in the operational grey livery were noted, both single- and double-seaters. 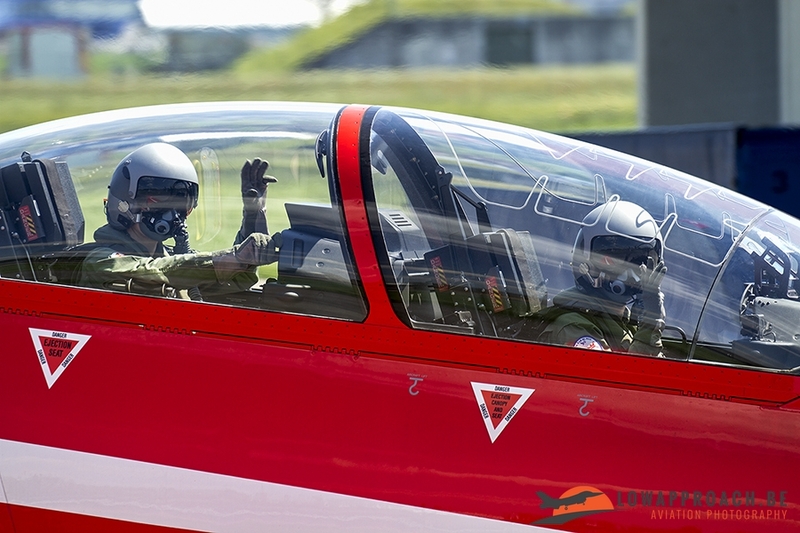 Here are a number of shots the team managed to make during our visit. 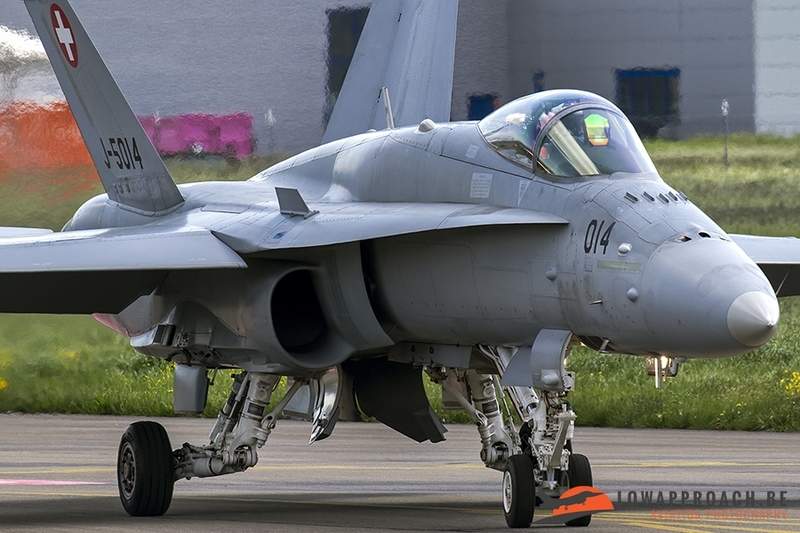 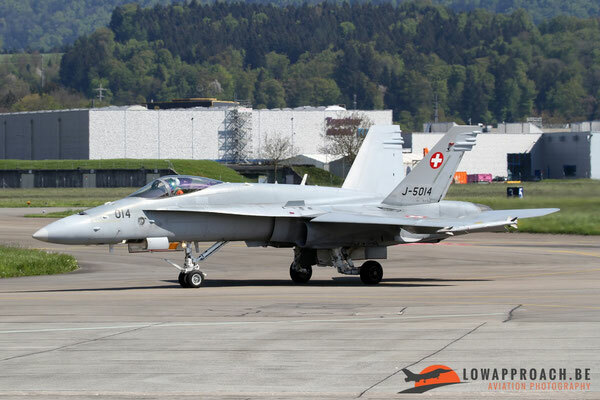 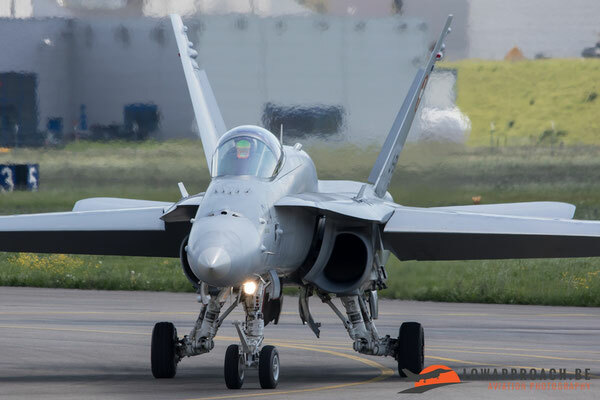 The McDonnell Douglas F/A18 Hornet is not based at Emmen, but during our visit one example was present who had undergone some maintenance at the Ruag factory also located next to the airbase. This aircraft made several test-flights before going back to an operational unit. 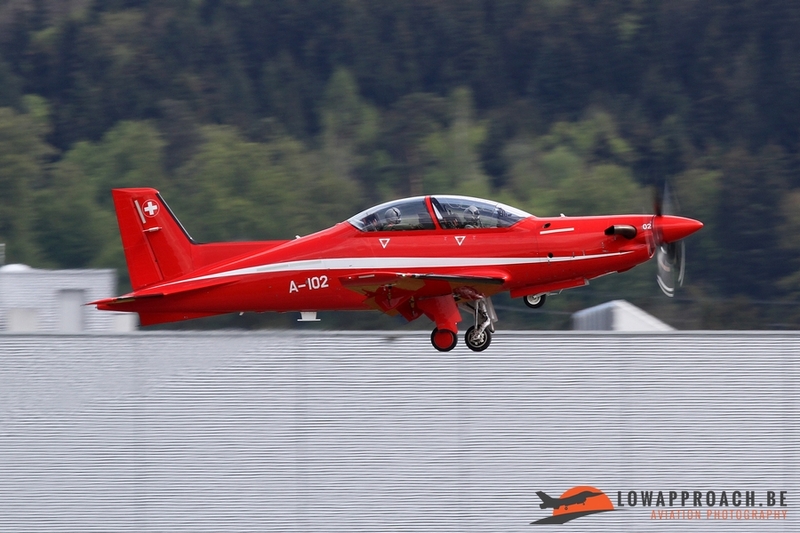 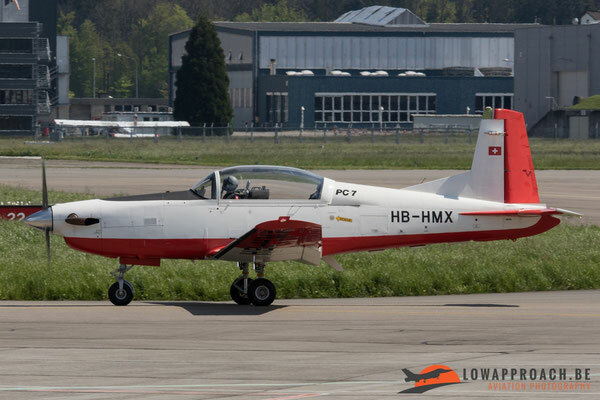 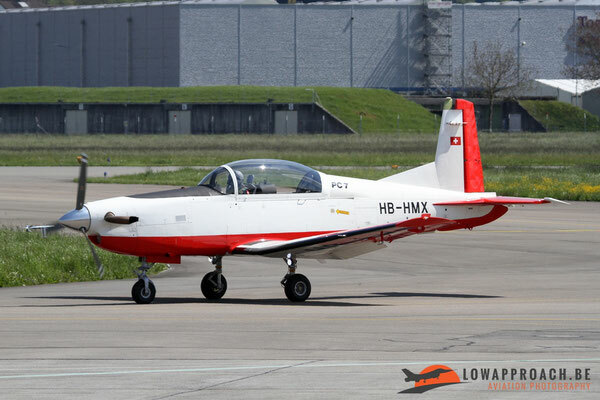 A second interesting aircraft type based at Emmen is the Pilatus PC21 operated by the Pilotenschule (Pilot's School). 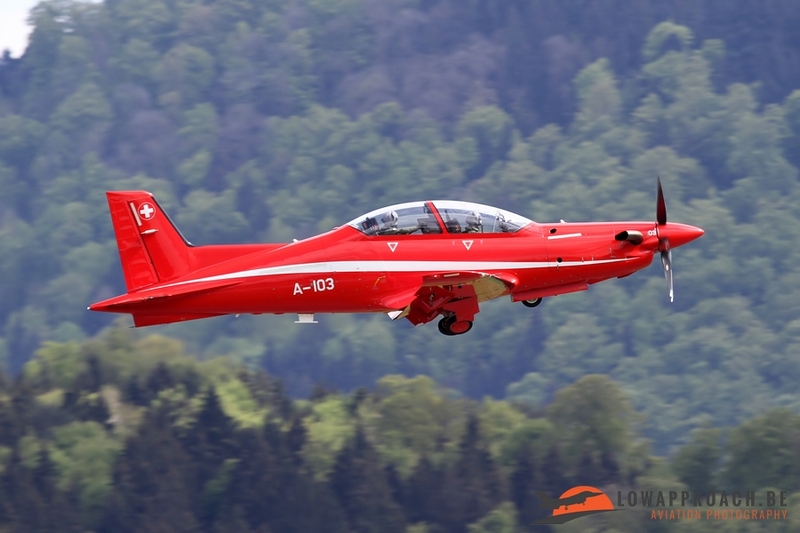 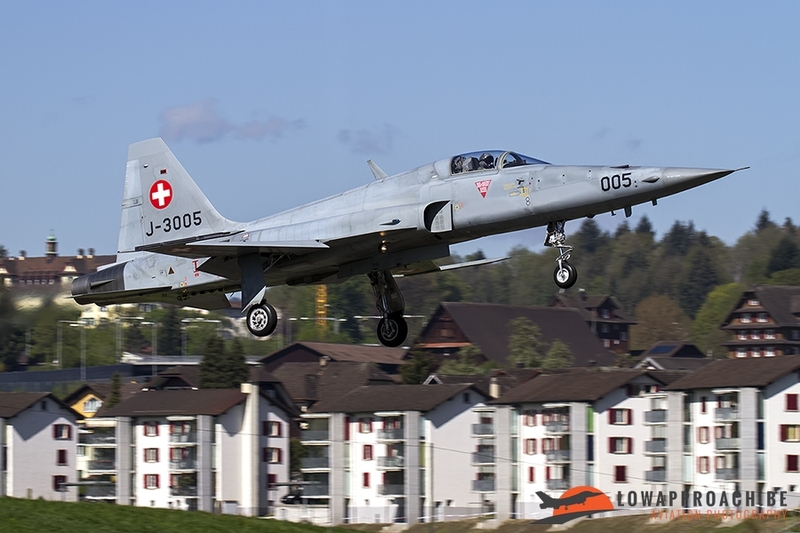 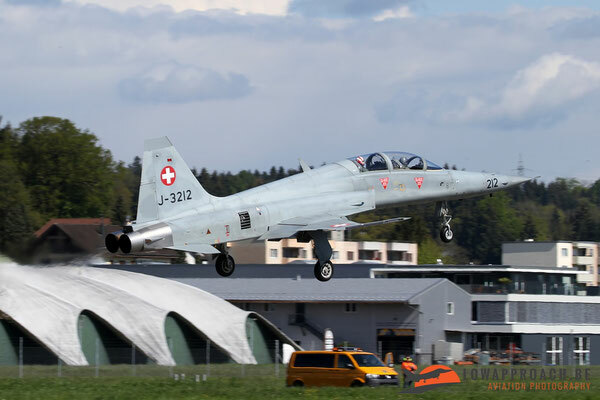 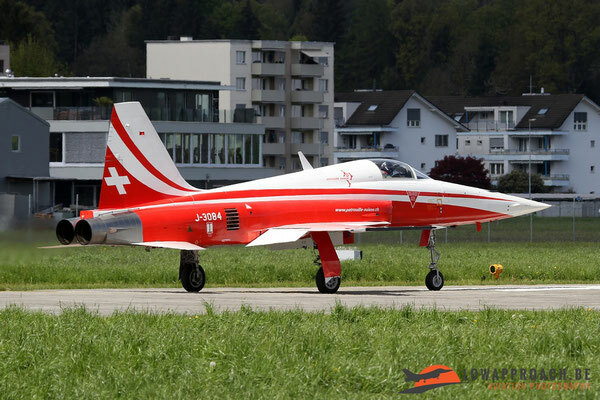 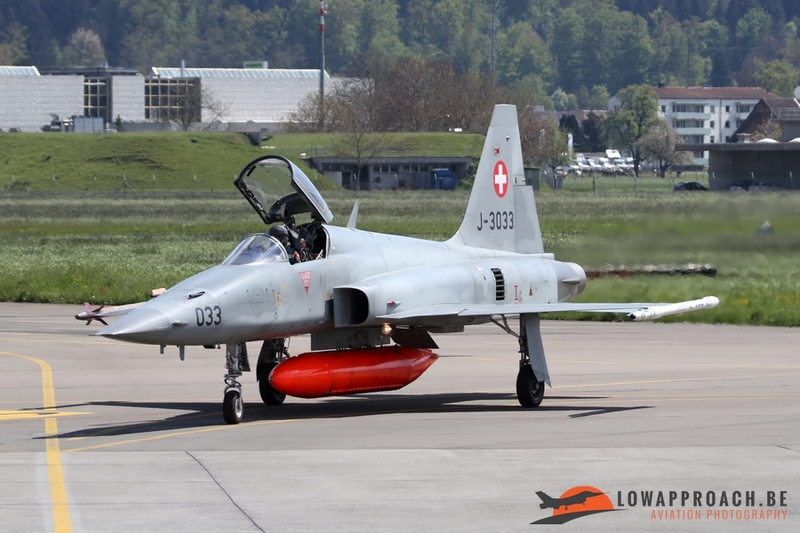 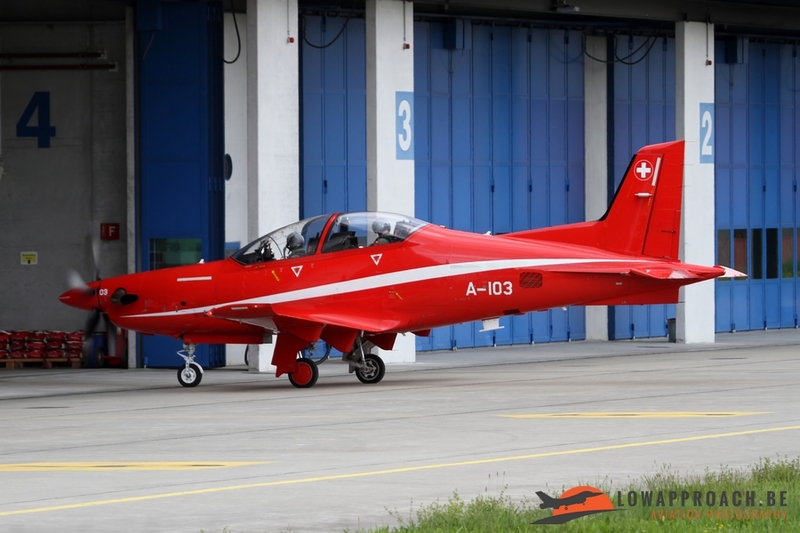 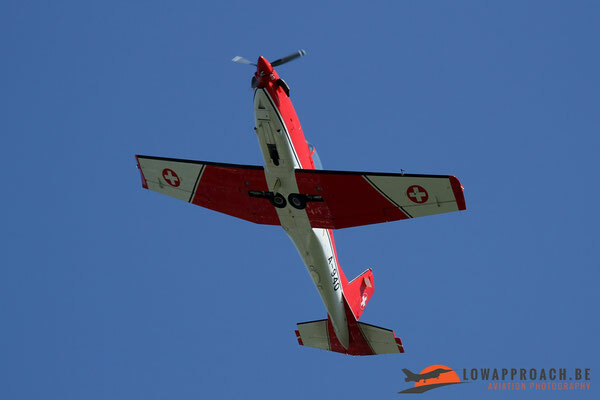 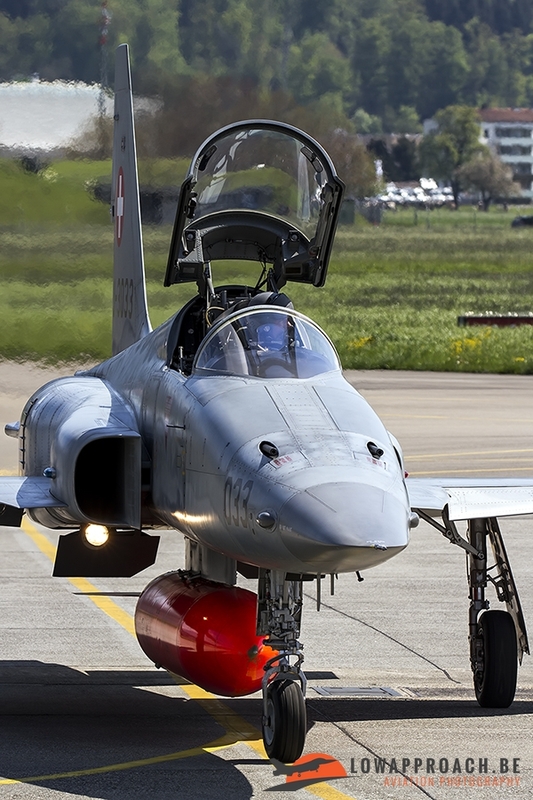 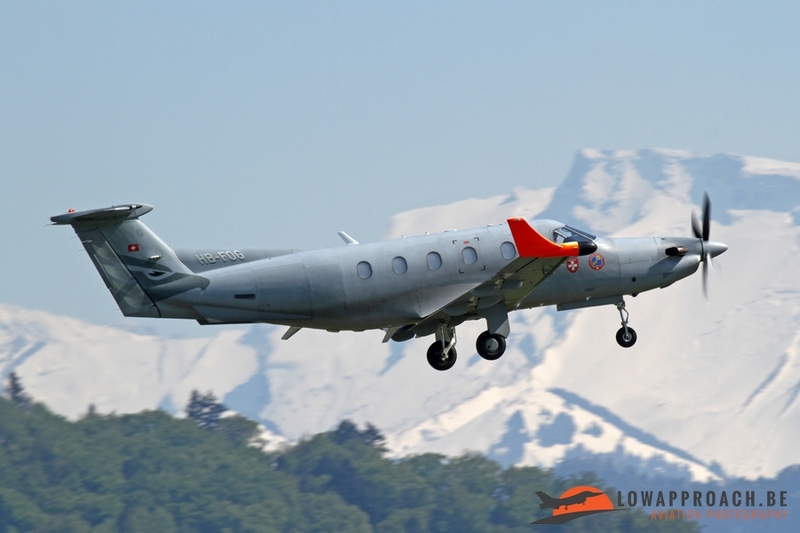 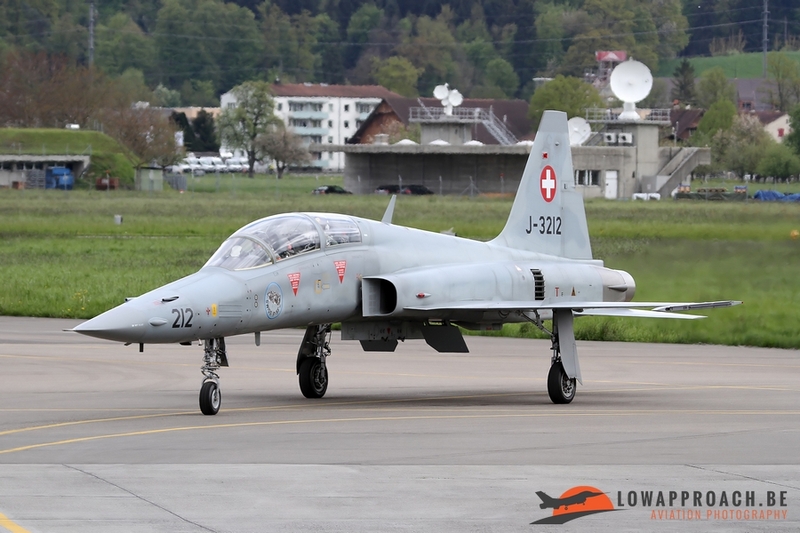 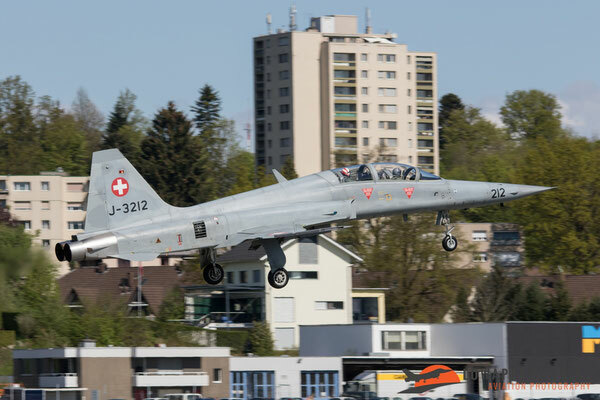 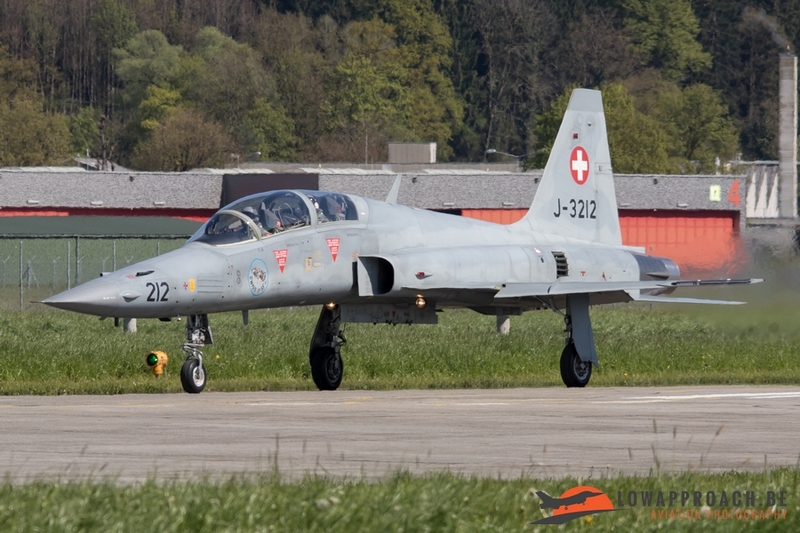 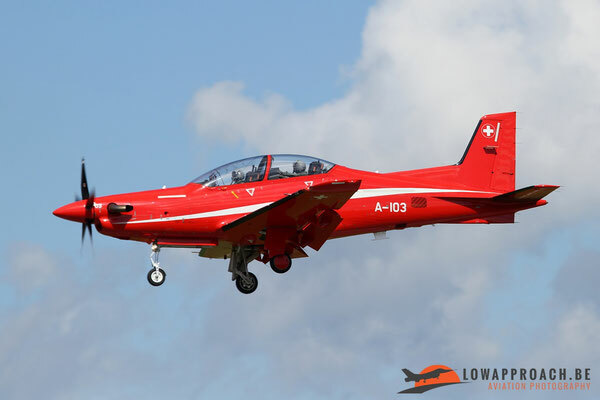 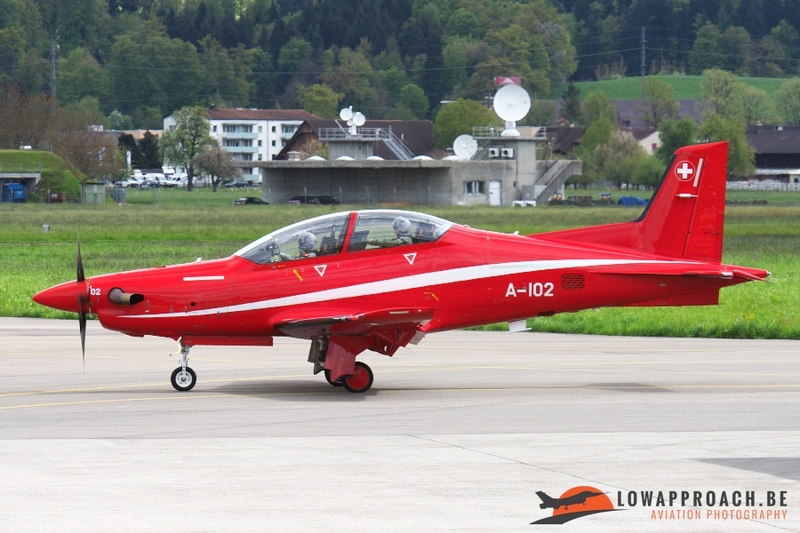 The Swiss Air Force operates 8 examples of the PC21 in the advanced training role. 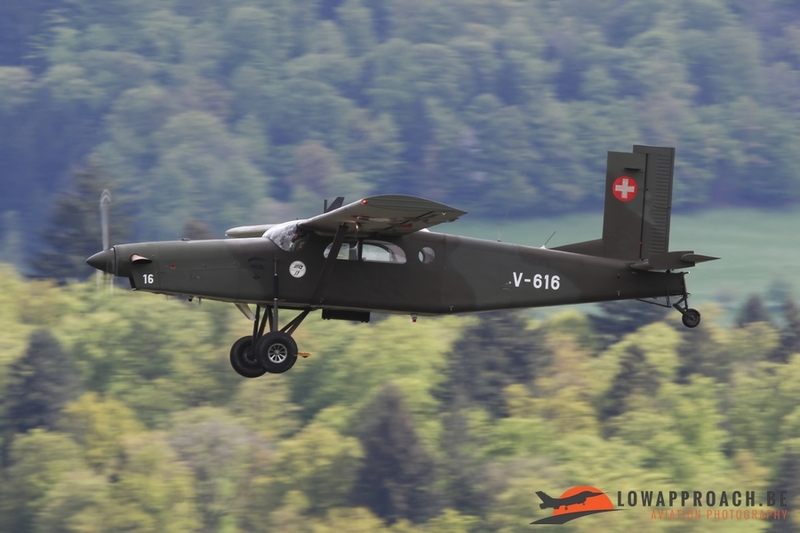 A rather special aircraft type based at Emmen is the IAI/Ruag ADS95 Ranger drone. 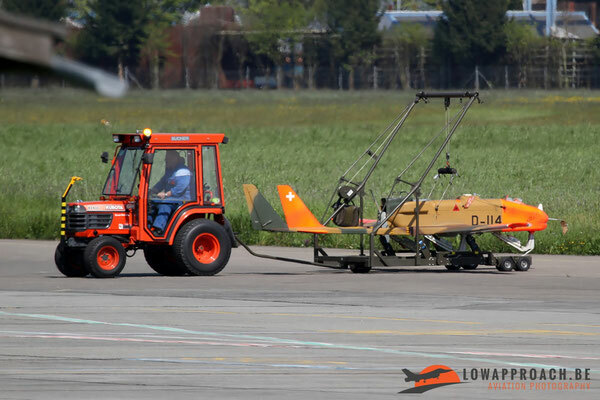 These Unmanned Aerial Vehicles are operated by Drohnenstaffel 7 and were quite active during our visit. 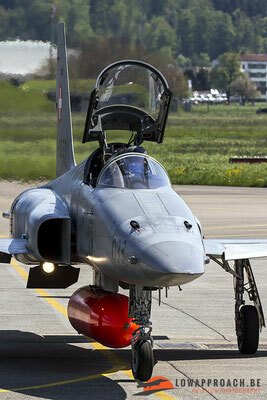 They are launched from a ramp located next to the spotters area. This drone is used for a large variety of missions as its on-board equipment can be modified according to the task, it is the only military drone that can be operated in civilian aerospace and flown over populated areas. 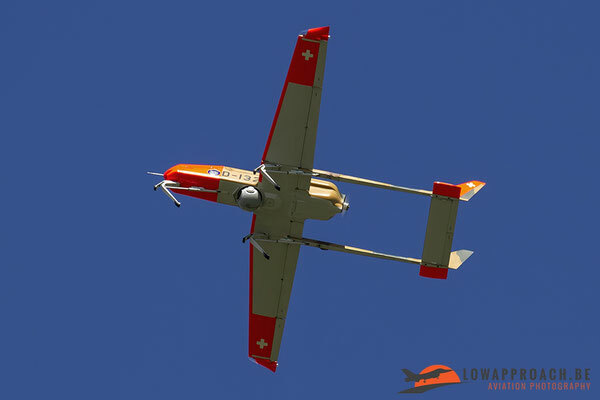 Due to its small size the drones are always in company of a Pilatus PC6 in civilian VFR (Visual Flight Rules) areas to make them more visible for the other air traffic. 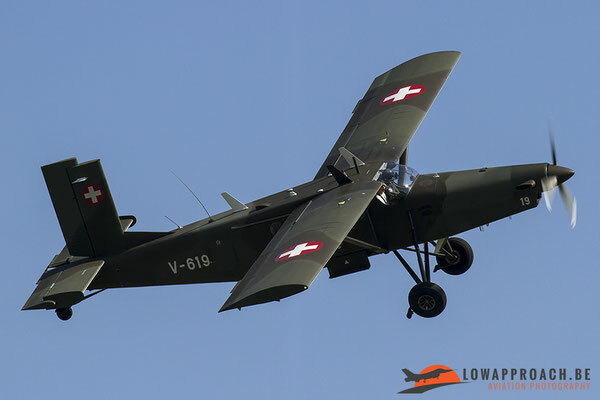 These PC6s are flown by the Emmen-based Lufttransport Staffel (Air Transport Squadron) 7. 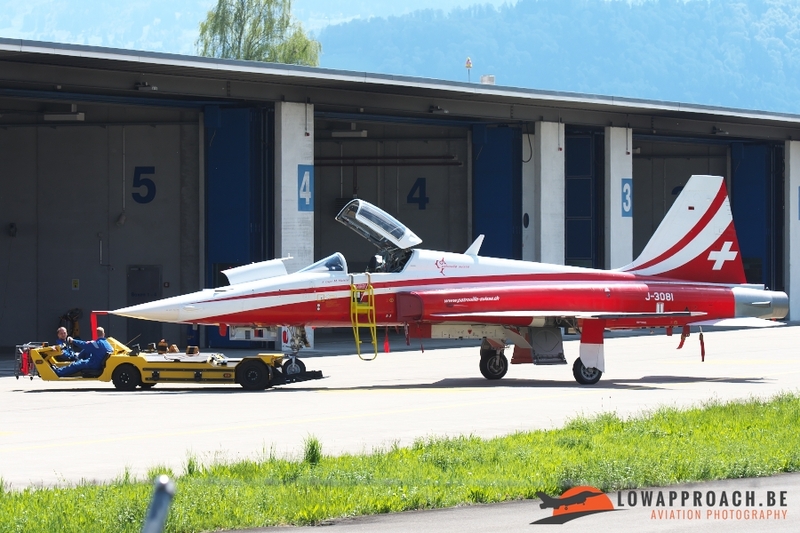 During our week in Switzerland we saw several examples of this ageing transport. 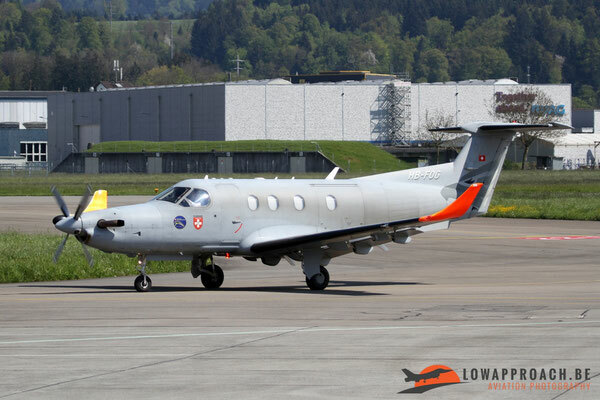 Another transport we spotted at Emmen was a civilian registered Pilatus PC12 owned by ArmaSuisse. ArmaSuisse is the government agency tasked with the procurement of armament for the Swiss Army. The PC12 is used for transport and calibration of the Florako radar system, the Multifunctional Information Distribution System (MIDS) Link 16 and aircraft radio systems. 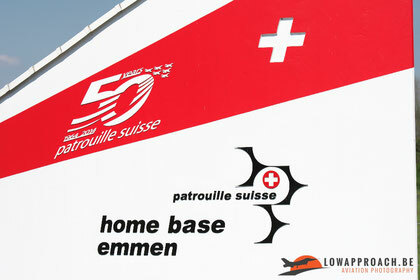 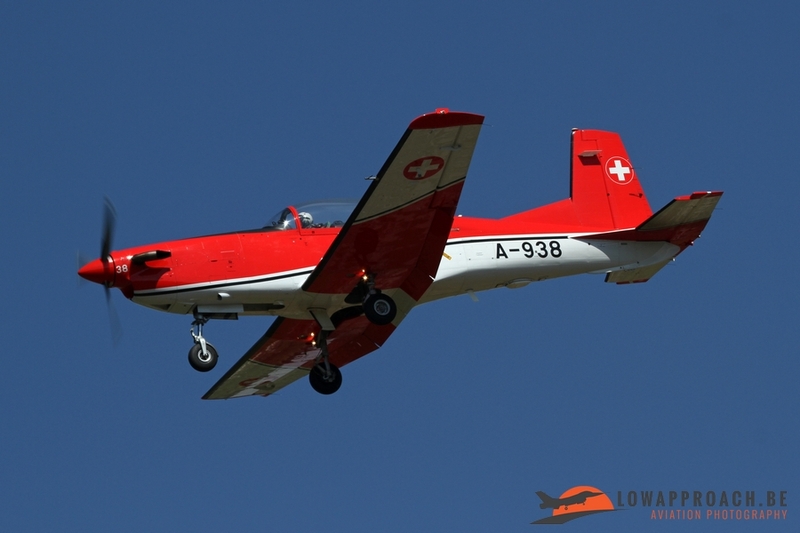 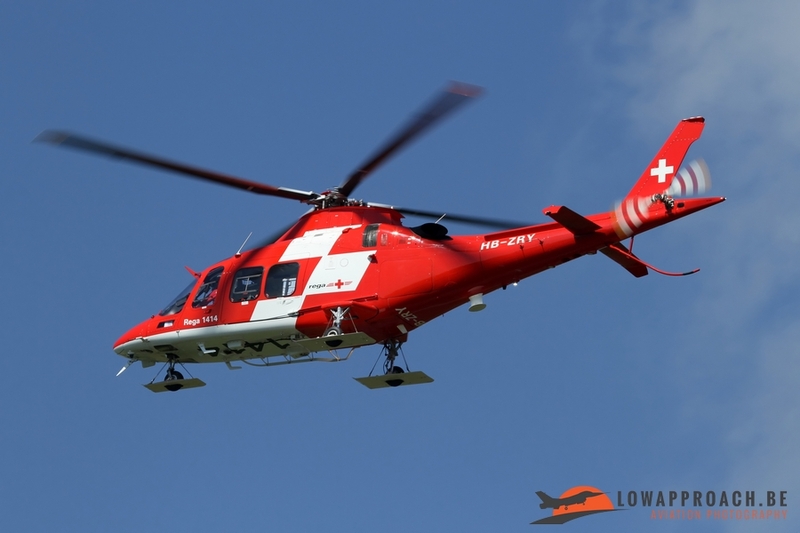 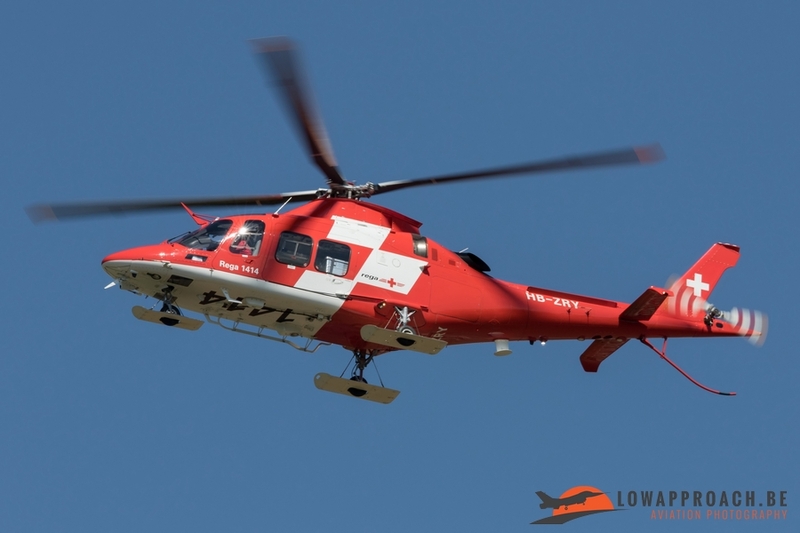 Emmen is also regularly frequented by visitors from other airbases, even from outside Switzerland. 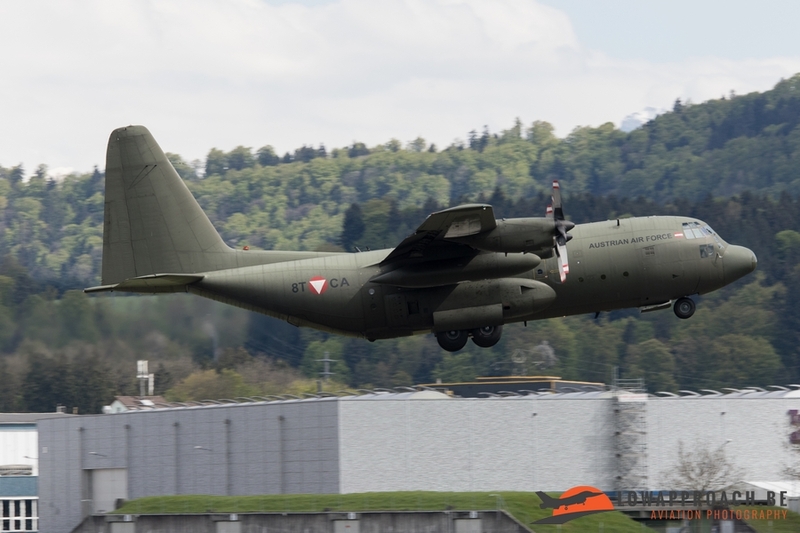 The only foreign visitor we noticed was an Austrian Air Force Lockheed C130K Hercules. 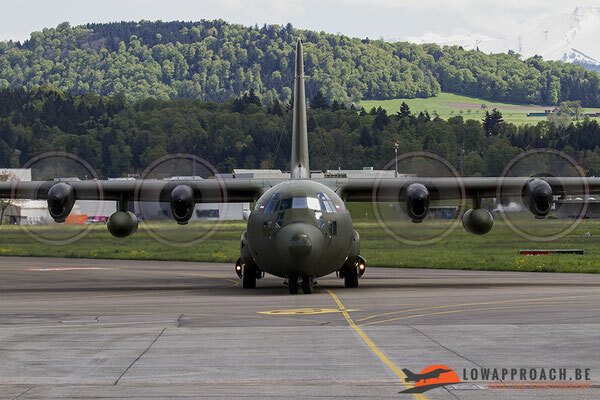 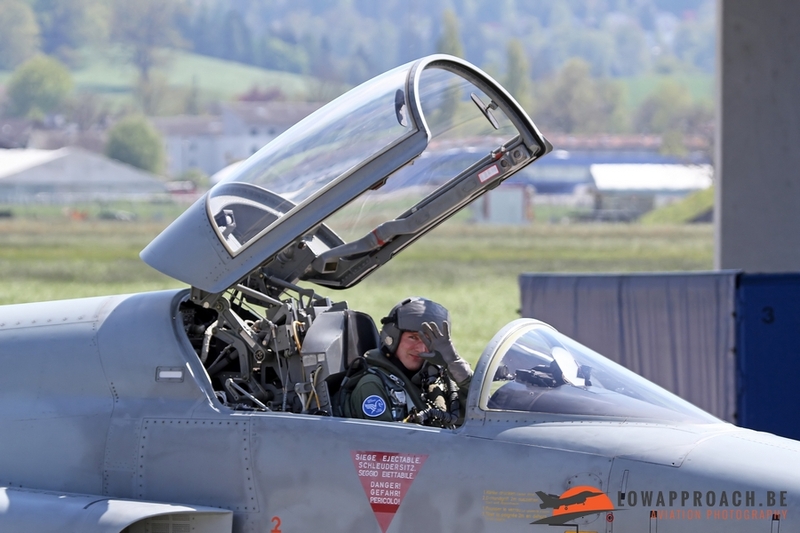 This former Royal Air Force-aircraft had been chartered by the Swiss military to transport a group of Swiss officers who had participated at a Joint Combined Staff Exercise in Sweden. 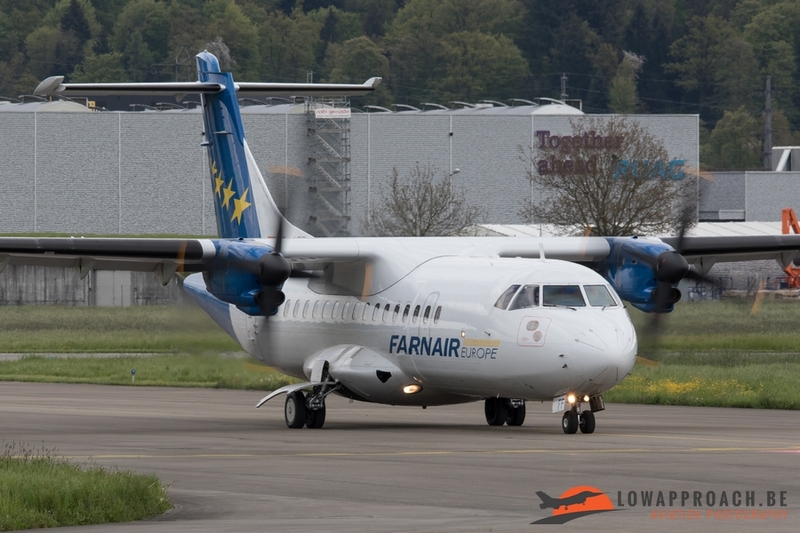 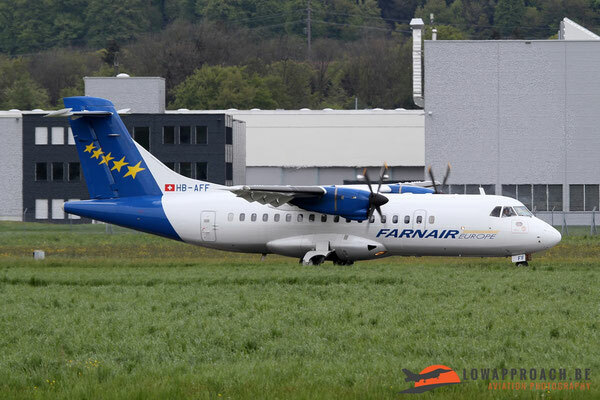 A second group made the same trip on board a civilian Farnair ATR42-320. Other visitors we noted during our days at Emmen were several Pilatus PC7s, military and a civilian example, an Agusta-Westland AW109SP rescue helicopter from Rega and several flyovers from Eurocopter AS532UL Cougars from nearby Alpnach. As with many locations in Switzerland Emmen is a great place for plane spotting. The base is fairly open and a large variety of aircraft can be seen. 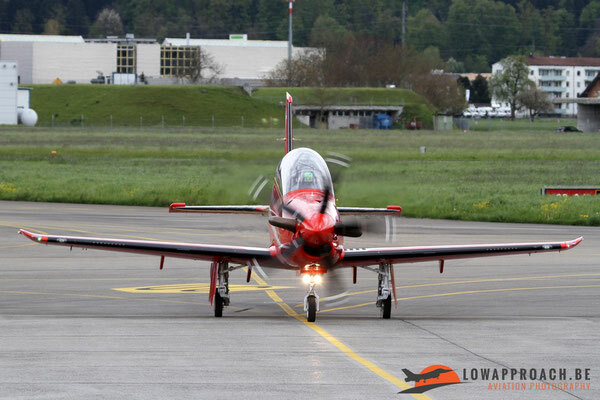 This combined with the stunning scenery makes Switzerland one of the nicest locations in Europe to perform our hobby.